For this week's challenge, we had to do a monotangle with "Bunzo". If you didn't know, a "monotangle" is a tile that only has one pattern on it. I tried to make the tile more visually interesting by trying a new take on the border and the pattern. I don't know whether this constitutes as a proper Zentangle tile.. It's of a proper size. I did draw a border. But since it was a monotangle, I didn't see the need of drawing a string... What do you think? 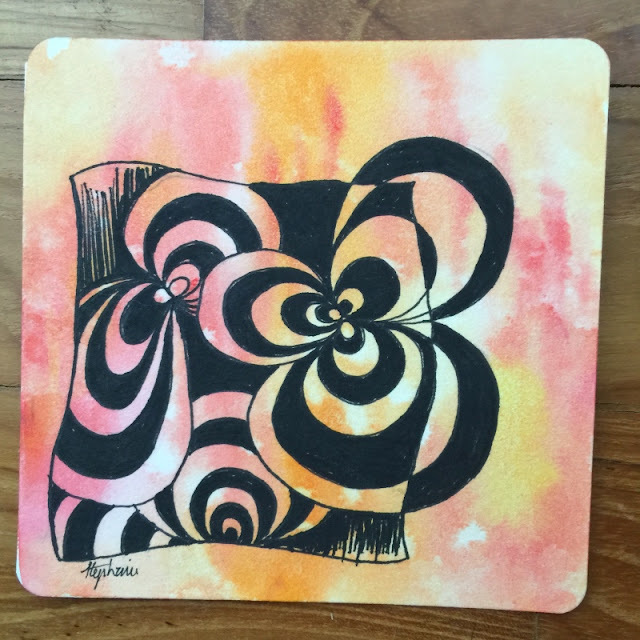 Is this a proper Zentangle tile, or should I call it "Zentangle-inspired"? Leave me a comment below letting me know what you think. This is so creative! Love the watercolour background and that the Bunzo overlaps the tile outline. I hope you will continue to do my challenges. Thank you! I'm looking at previous challenges you've posted and trying to see which ones catch my attention. I have plans on attempting Challenge #57, the one with the sand pattern..